New, bigger&better scans of the same comic uploaded 4 years ago. Synopsis: Kaänga comforts a dying archaeologist and takes the gift the old man gives him, a small idol. Later, criminals come looking for the idol, certain that it contains jewels. Kaänga dumps the thieves into a quicksand pit and reveals to Ann that he had taken the jewels from the idol to raise money to help feed N'geeso's people. Synopsis: Archaeologist Winters is wounded by his guides when they decide to take the treasures of the Temple of K'nassa for themselves. Winters' daughter secures the help of Camilla against the thieves and the treasure is committed to a museum. Credits: Script: ? [as Victor Ibsen] | Pencils: Matt Baker | Inks: Ray Osrin ?; ? Synopsis: During a drought, Simba leads his followers to a water hole ruled by another lion. He and Bordag, the other lion, fight to the death, with Simba triumphant. Synopsis: Garson and his gang, hoping to loot the native villages come to the jungle claiming to carry insecticide for tsetse flies, but in reality carrying knockout gas. Terry overcomes them and sends them to prison. Synopsis: Brief descriptions of some animals held as sacred. Credits: Pencils: August Froehlich ? | Inks: August Froehlich ? Synopsis: Chief Asama's hunters trick Wambi into blowing a hunting horn that attracts the local buffalo, several of which are captured. 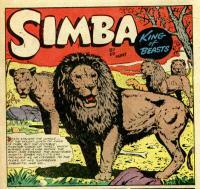 The animals of the jungle accuse Wambi of being in league with the hunters. Wambi sets out to prove his innocence and goes to the hunters' sacred cave, where the buffalo are to be sacrificed. Once there, he again blows the hunting horn and the jungle animals come and see the hunters and believe in Wambi's innocence. Synopsis: A description of the natural resources of the Belgian Congo. Synopsis: The ghost of the late queen, Lara speaks to Tabu, telling him that she was murdered by the witch doctor Karoa and that the wizard intends to kill her son, as well. Tabu confronts the witch doctor and exposes his crimes to the villagers, who sentence him to death.